Saying Moderator Is Prettier Than CNN's Crowley Gets Candidate In Trouble : The Two-Way Richard Carmona, a Democratic candidate for the Senate from Arizona, stepped into controversy by telling a male debate moderator that "you're prettier" than the CNN correspondent. As Republican Rep. Joe Walsh of Illinois was courting controversy last night by saying during a debate that the "health of the mother" isn't a reason for an abortion anymore, out in Arizona a Democratic candidate for Senate was stepping in it by telling a male debate moderator that "you're prettier" than CNN's Candy Crowley. BuzzFeed Politics has the video of Richard Carmona getting himself in trouble. It happened when moderator Brahm Resnick, after some tough exchanges, joked that "geez, now I now how Candy Crowley felt." That, of course, was a reference to the flak Crowley took during Tuesday's presidential debate. 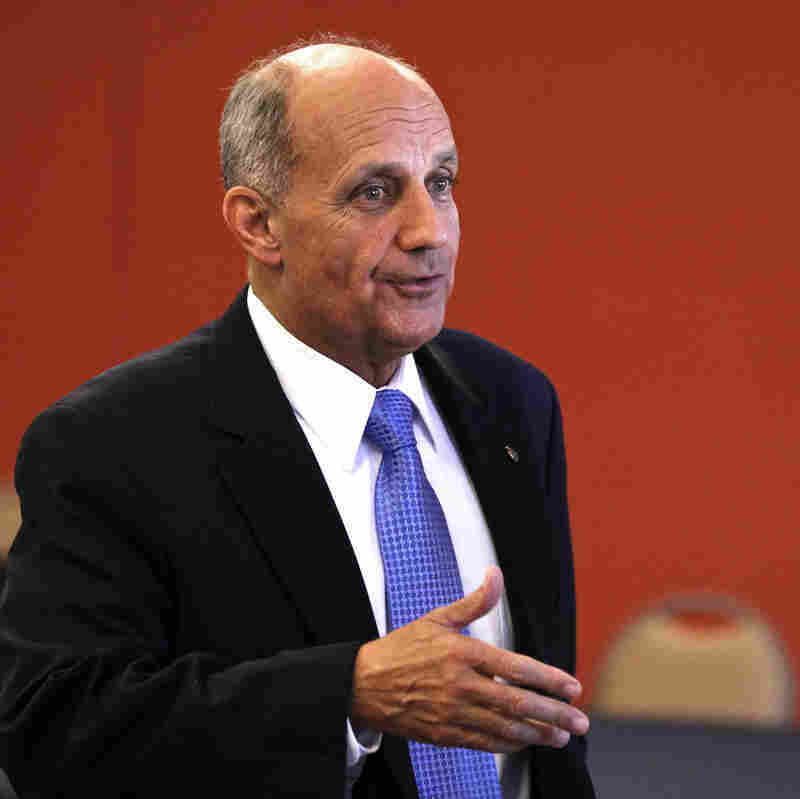 Democrat Richard Carmona, who is running for the Senate from Arizona. Carmona reached over and patted Resnik's arm, while saying "you're prettier than her." Today, BuzzFeed adds, Carmona is apologizing: "I tried to tell a joke to lighten the mood in a debate. I shouldn't have, and I'm sorry," Carmona said in the statement. As Politico says, Carmona's comment last night likely won't help him with women voters. NPR's Ted Robbins is due on All Things Considered later today with more on the Senate race between Carmona and Republican Rep. Jeff Flake. Watch It's All Politics for Ted's reporting. Update at 3 p.m. ET: By mentioning Walsh's comments about abortion, we were not drawing a link to Carmona's position on that issue. The link we were making was to two candidates who said things during debates Thursday that have caused controversy. The Carmona campaign's press secretary, Elizabeth Kenigsberg, writes to remind us that Carmona, a medical doctor, "is the former surgeon general and one of the country's most highly regarded health policy experts. He ardently supports a women's right to be in charge of her health care choices."